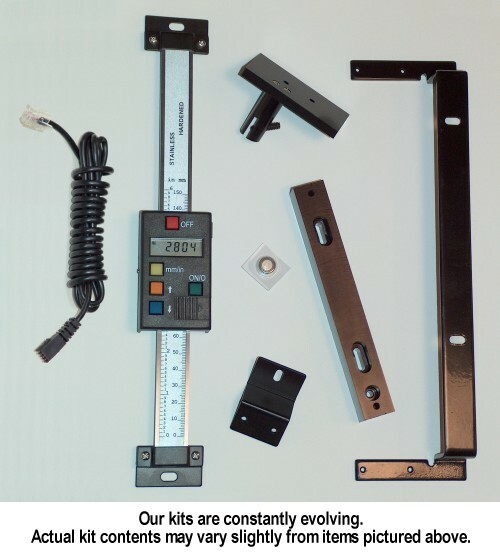 Capacitive linear digital scales - available separately or in kits with mounting brackets to fit your machine. These scales are first quality - from China's largest and oldest instrument manufacturer. We source them directly from the importer and they carry a one year domestic warranty. Available separately in either horizontal or vertical styles in a wide range of lengths, these scales can be used on virtually any type of machine to provide accurate position information. Beam End Clips, a slider Z-Clip, and a Silver Oxide Battery are included. Standard scales come with 3 buttons - Inch/Millimeter, Zero, and On/Off. Some models include additional buttons or functions such as; Preset, ABS (absolute), and Set. All scales have a Data Port output which can be connected to remote LCD displays, DROs (Digital Read Outs), or PCs. Data cables are available separately. 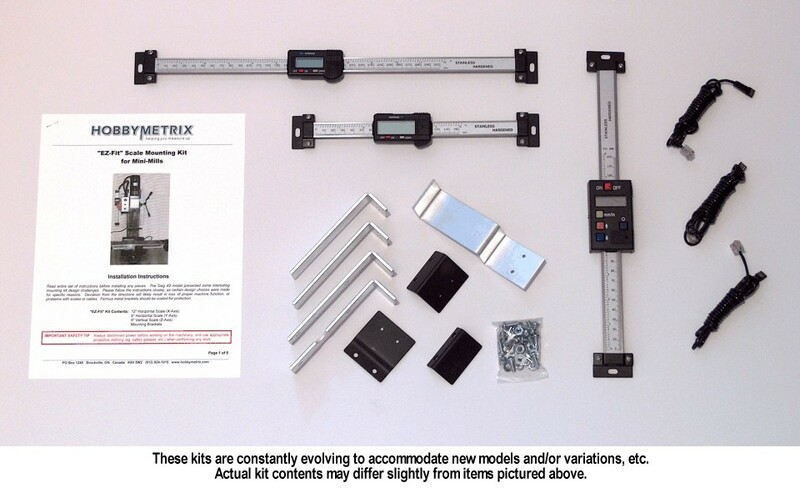 For convenience and quick installation, sets of scales are also available in pre-configured kits which include specific mounting brackets to fit popular home shop mill-drills, milling machines, and lathes. 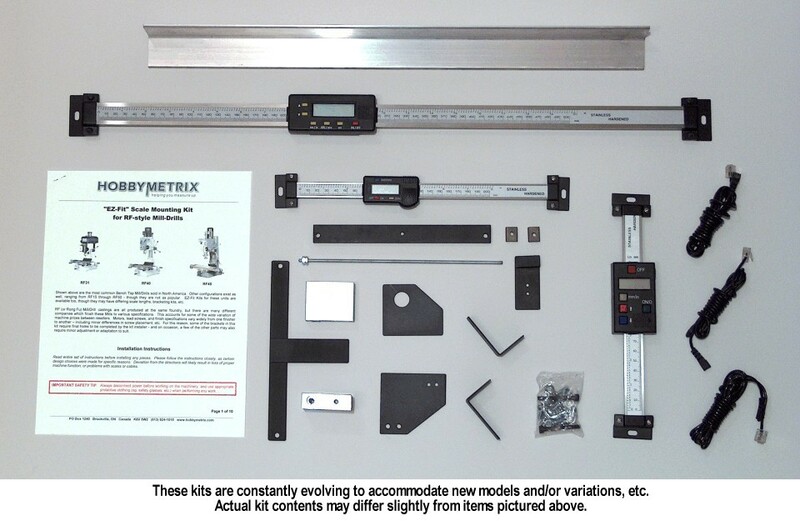 If you don't see a scale kit listed for your particular machine, please ask us about it. Kit development is ongoing and a kit for your machine may already be "in the works". If you have a vintage or a less popular brand of machine, we may still be able to help save you time and effort in adapting scales to it. 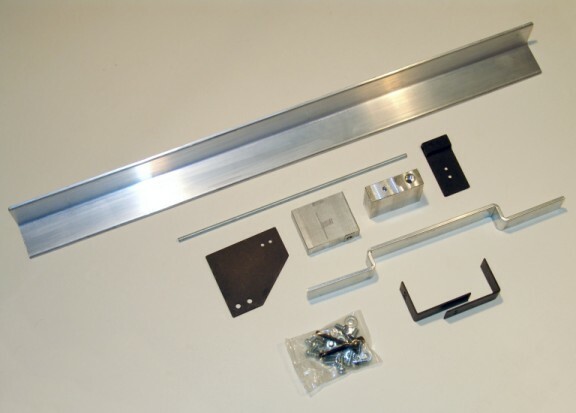 For instance, an existing kit may contain brackets which can be easily modified to suit your installation. 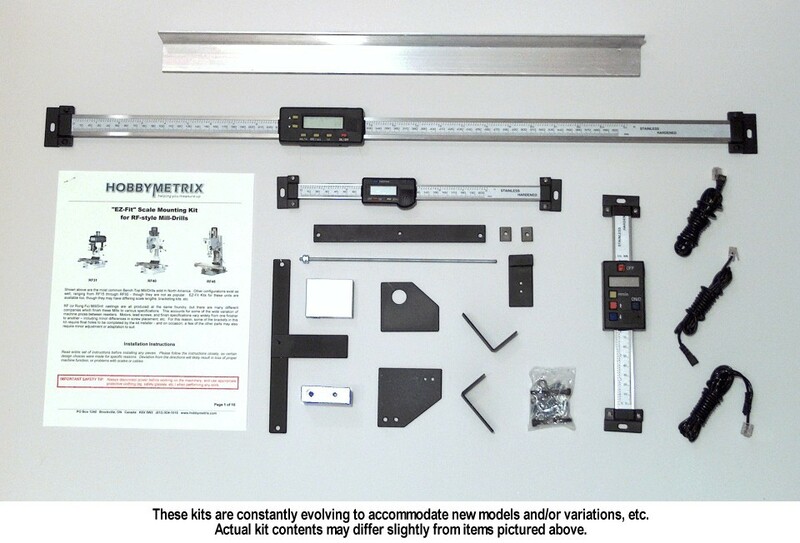 Scales offered by HobbyMetrix are first quality. They are manufactured by China's largest and oldest CE/ISO9001;2000 certified instrument manufacturer and we source them directly from the importer. The sliding readout has adjustable brass gibs which ride on hardened stainless steel beams. The size of a scale's beam depends on its length. Scales 16 inches and shorter are supplied with beams having a cross section of 16mm x 4mm for the horizontal type and 20mm x 4mm for the vertical type. Longer horizontal scales are delivered with heavy duty beams, measuring 24mm x 5.5mm - to provide increased support for their extended lengths. Standard scales are packaged in cardboard cartons and the heavy duty scales come in wooden cases. Scales which fit popular home shop machines typically do not exceed 36" (900mm), however, scales are manufactured in lengths up to 80" (2000mm). If you need a scale which is longer than those listed below, please contact us for availability. Scales may easily be shortened using a rotary tool with a small abrasive wheel. Horizontal Scales - Short 4" through 16"
Horizontal Scales - Long 20" through 36"
Vertical Scales 4" through 16"
X-Axis Horizontal Scale - 12"
Y-Axis Horizontal Scale - 6"
Z-Axis Vertical Scale - 12"
Have a non-standard Mini Mill? We can probably still help - [Contact Us]. 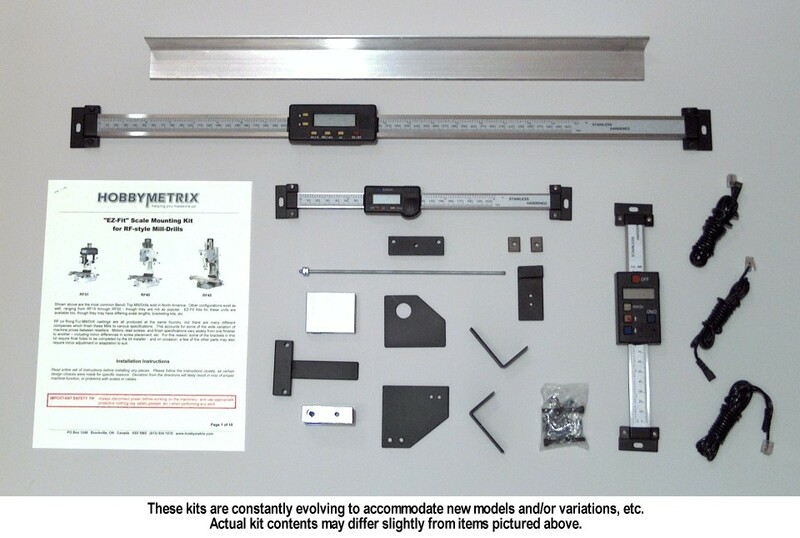 Z-Axis Vertical Scale - 8"
X-Axis Horizontal Scale - 16"
Z-Axis Vertical Scale - 5"
This EZ-Fit Kit consists of appropriately sized scales to fit X3 machines, along with X2 bracketry. Although some minor modification and fitting of the brackets may be required, they will still save you hours of design and fabrication time. Z-Axis Vertical Scale - 4"
There tend to be many variations of the RF-25 Mill-Drill - more so than within the rest of the RF model line. This EZ-Fit Kit consists of appropriately sized scales to fit common RF-25 dimensions, along with RF-31 bracketry. 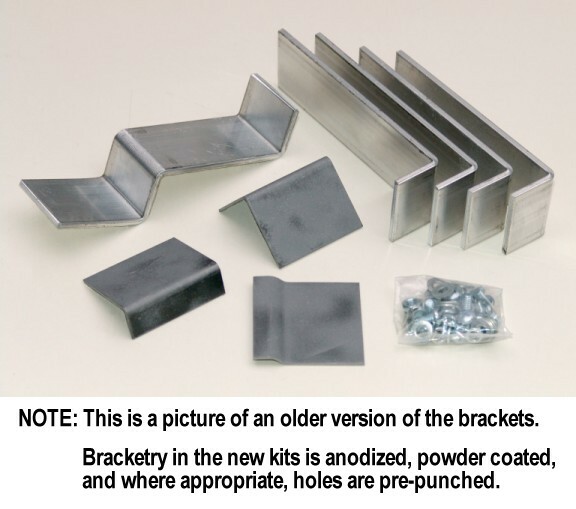 Although some minor modification and fitting of the brackets may be required, they will still save you hours of design and fabrication time. X-Axis Horizontal Scale - 20"
Y-Axis Horizontal Scale - 8"
X-Axis Horizontal Scale - 24"
A perfect companion for YADRO's new Knee & Quill support!